What is myPOS DATA Card? DATA Card is designed exclusively for myPOS Devices and ensures 24/7/365 mobile connectivity throughout Europe, Martinique, Guadalupe and Reunion. Inserted in each myPOS Device, it guarantees that once you receive the POS terminal you can start accepting payments right away, without any additional costs for connectivity. 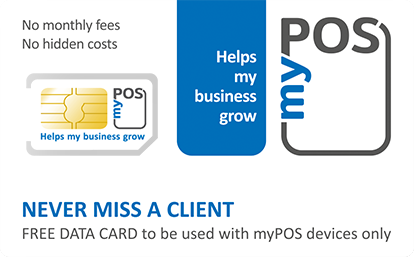 How myPOS DATA Card benefits your business? Want to order a device?